At least five people have been killed and seven wounded after a suicide bomb attack on a restaurant near a local government building in the Somali capital, Mogadishu. The attacker drove a car packed with explosives outside the busy restaurant, a spokesman from the mayor's office told the BBC. 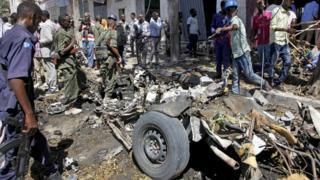 Islamist militant group al-Shabab has said it was behind the attack. The group, an al-Qaeda affiliate, is waging an armed insurgency in Somalia. Al-Shabab frequently carries out attacks in the Somali capital. The government, with the help of African Union forces, is fighting al-Shabab to regain control of the country. The militants pulled out of Mogadishu in 2011.